We went to see Gatz at the ART the other night. 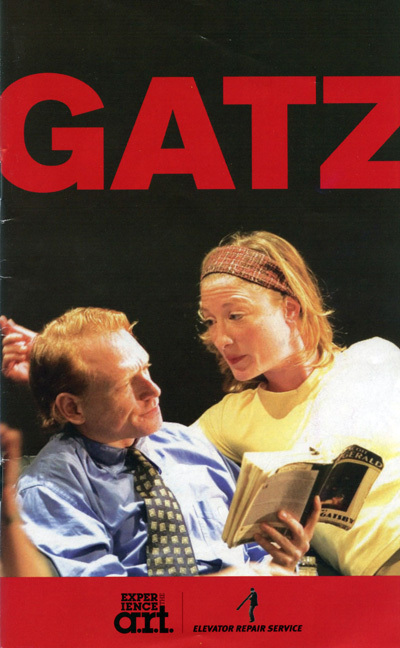 Gatz is a play by the Elevator Repair Service which is based on the novel The Great Gatsby. It’s a very interesting production. It takes place in a fairly generic office. One of the characters is waiting for his computer to be repaired, and he picks up a book and starts reading. It’s a copy of The Great Gatsby. As he reads, the other actors slowly start becoming characters from the book. He reads the entire book. The play is something like 7 hours long. It turns out to be a very compelling presentation. It has a lot of the visual interest of the theatre without losing the beauty of Fitzgerald’s writing. J. D. Salinger died yesterday. The Catcher in the Rye and The Great Gatsby would make most people’s short list for The Great American Novel. Nick and Holden, together with Huck Finn, pretty much set the mark for what we think of as the voice of the young American male. They’re also novels which have a reputation for changing people’s lives. I can’t say that either of them had that effect on me. I think that these are books that resonate for people if they’re read at a very particular time in their lives. That time when you’re just starting to become cynical about what’s possible in life. Mike forgot to mention that the person sitting next to us at Gatz pt 2 on Sunday was reading Catcher in the Rye during the breaks. She was intensely underlining key passages in her copy of the book. Somehow it seemed appropriate to be doing that while at a performance of Gatsby.